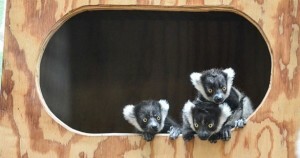 28th august 2013 as marked one of the happiest event in the calendar of Khao Kheow Open Zoo Everyone at Khao Kheow Open Zoo are ecstatic to welcome a set of 4 Ruffed Lemurs. The JTTJ team along with our honored Director Mr. Suriya Saengpong introduces two male and two female Ruffed Lemurs in the Amazing Madagascar zone of the zoo. Lemurs are native to the vibrant island of Madagascar. The ruffed lemur is the largest of this species. It is easily recognized by its black and white or black and brown stripped fur. It surely has a pretty heavy coat of fur for a lemur. It weighs around 3.8kgs and is predominantly frugivorous and so eats fruits, but also eats vegetables, leaves, nectar from flowers and edible fungi. 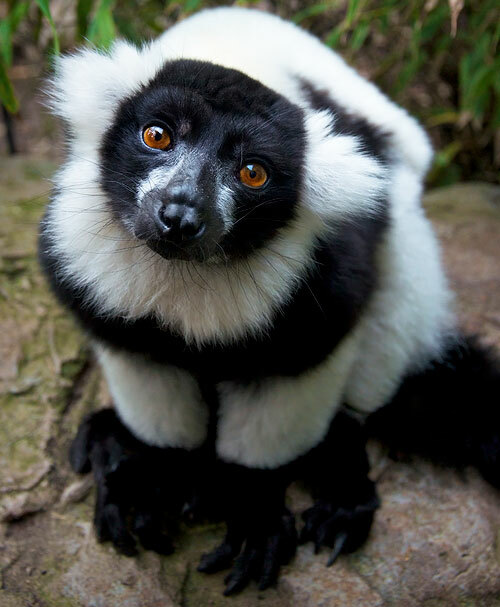 The Ruffed Lemur’s scientific name is Varecia Variegata. They usually live in groups of 2-16. In case of lemurs the female is larger and more dominant than the male. The gestation period is 102 days and a female lemur in a group is responsible for looking after 3-6 young lemurs. The average life of these creatures is 15-20years in the wild and 25 years in captivity. Lemurs can send sound signals that can be heard within a range of 1 kilometer radius through the forest. You can also welcome these lively creatures by visiting the Lemur Land at Khao Kheow Open Zoo. We eagerly await your visit!! !